Slate Digital is treating Pro Tools 11 users with some love. 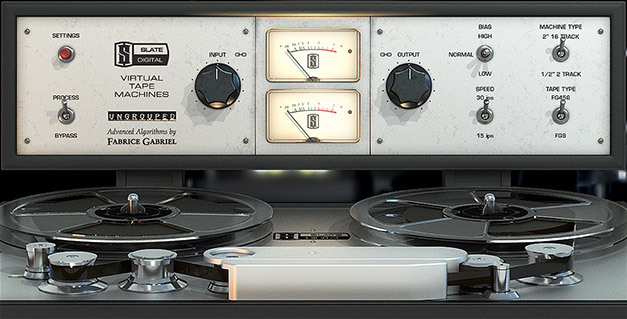 They have released a public beta of their Virtual Tape Machine plug-in in AAX format. There are many improvements in this new version which you can see in the list below. First reports are saying that VTM 1.1.0.6 uses only 1/8th of the CPU load compared to the old one. Now that is a big WOW!! And it’s not just Pro Tools users that get all the fun. This version should bring the same performance increase on all formats (VST, AU, RTAS and AAX). – Option to Hide the Reels. – Input & Output Gain Link is now UI link only. For instance, automating the Input Gain will only write automation for the Input Gain parameter. To get your hands on the beta version of VTM, you have to visit your Slate Digital user account. Feedback on issues with the VTM beta version have to be reported through Slate Digital’s help desk. 2 Once logged into the Slate Digital help desk, click the “Ask A Question” link. 5 Please give a brief summary of the issue in the Subject field. – VTM Version (Click the Slate Digital logo in the preset bar. Finally, you may attach files such as audio examples, crash logs, or system profiles by clicking “Attach File” at the bottom of the form. Upon submitting your feedback, you will be asked to login or to create an account. If you need to create an account, a verification email will be sent to you. Your feedback will not be submitted until you’ve verified your account. – Installer doesn’t uninstall previous version. Please manually remove the previous version from your plugin folders. – Updated User Manual is forthcoming. Since updating the framework to utilize the latest PACE Eden protection, there have been some reports of users unable to authorize the updated plugin. This type of bug has been less than 3% of users. Slate Digital is working closely with PACE to resolve this issue. If you are unable to authorize the new version of the Virtual Tape Machines plugin in any DAW on your system, please send a system profile to our Technical Director, Anthony Taglianetti at anthony.taglianetti@slatedigital.com. Steven Slate has also written an apology to their users via e-mail, explaining why it took them longer than anticipated and why they have broken their word on delivery of the beta version. Here’s a transcript of that e-mail. Folks, we have let you down and we know it. We’ve constantly missed deadlines, and it is unacceptable and we are taking measures to improve. However, we have really tried our best to provide estimations of releases based on the facts we have at the time. Programming is not an exact science. Unforeseen issues occur almost daily, and it’s very difficult to predict how long these issues will take to get resolved. So what is taking us so long? Are we being lazy with new legacy updates and focusing more on new products? Absolutely not. The team that develops new algorithms is separate from the developers working on updates. The main issue is that we chose not to put band-aids on old code, but rather, to recode the plugins in our new framework from scratch to be able to have more stability, remove old bugs, and have MUCH more efficiency. You’ll see this with the VTM. You can double your instance count and have much less CPU hit than in the previous version. We’re working hard to get the last two plugins, VCC and FG-X, into the new framework and we will be hiring even more developers to assist in these final stages. I promise to keep working hard and communicating with you, as you are the most important aspect of our business. We strive for customer satisfaction, and will continue to do so. Thanks for your support and patience. Now that’s the kind of developer I’d support any day. Honest proper feedback with a clear explanation on why things took longer. It’s still not nice to have to wait but it sure as hell makes it easier, knowing they are working their B#tts off and improve the software you love to use. Yep, a true example!